It’s something many of us have done in a change room snapped a picture of ourselves in an item of clothing to send to a friend or family member to get their opinion. When a girl named Syd sent a photo of herself in a formal dress to the incorrect number, she had no clue it would have such a ripple effect. Instead of landing in her friend’s inbox, the photos were received by tony wood, a real estate agent and father of six from Tennessee, USA. 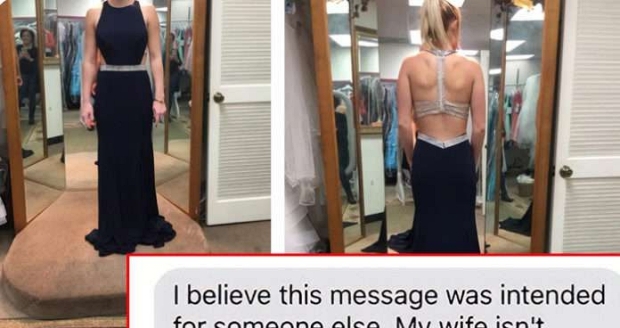 Instead of shooting back the standard “wrong number” text, he decided to have a bit of fun with it, and got his children to deliver their verdict on the dress. The following pictures were sent to him. The message was accompanied by a photo of his children giving Syd’s look an enthusiastic two thumbs up. A friend of Syd’s, Mandi Miller, posted the adorable exchange on Twitter and it quickly went viral. The post has since been retweeted 172,000 times and has 690,000 likes. The viral Tweet brought attention to the family’s Facebook page, and people discovered that missing from the photo of the kids was 4-year-old Kaizler. It turns out that when the photo was taken, Kaizler was in hospital with his mum, undergoing chemotherapy to treat his leukaemia. Something that Tony confirmed when he responded to Mandi’s Tweet. People touched by Tony’s kind response to Syd’s accidental text message jumped on the Go Fund Me page to donate money. It has now raised $11,400 for the family and is still climbing. He told “since this all started we’ve had over $US3,000 ($3,800) donated. Tony’s wife Rachel also told the website she has been overwhelmed by the reaction.